Targeting everything from land owners, farmers, and business owners to building contractors and families. Some would say Mercedes should have focused on a different segment of the market rather than coming out with the X-Class. The head honchos at the three-pointed star company beg to differ as they’ve done the analysis and figured out there is room in our wonderful automotive world for a premium pickup. Its closest rival will be the Volkswagen Amarok, also a posh workhorse but not on the same level with the “Mercedes among pickups” as the X-Class is being described in the press release. It will be available in three distinct flavors: Pure, Progressive, and Power. The first of the bunch – pictured in the gallery in black - will act as the base version tailored to those on the look for a rugged pickup truck riding on steel wheels and without a long list of goodies that would jack up the price. The mid-range trim is the yellow one with more comfort functions and an upscale exterior. The top-of-the-line Power finished in white has all the bells and whistles, including leather upholstery and the bigger display for the infotainment system. It also gets a chromed bumper, fancier air vents, electrically adjustable seats, and an optional Style Package. Mercedes-Benz Vans will sell the X-Class with a ton of accessories, ranging from soft and hard tonneau covers to a canopy that makes the pickup truck look more like an SUV. The first-ever X-Class will boast the brightest light output in its segment thanks to LED headlights with six light-emitting diodes in each cluster. The rearview camera can be complemented by an optional 360-degree camera to see everything that’s going on around the vehicle. Europe, Australia, and South Africa will be the first markets to get the X-Class after production at Nissan’s plant in Barcelona will kick off later in the year. From 2019, the Renault factory in Argentina will commence assembly for the Latin American market. In Germany, Mercedes is asking €37,294 (including VAT) for the base X-Class Pure. For reference, the Nissan Navara upon which is based starts at €26,910 in Deutschland. Thanks to its long 3150-millimetre wheelbase, the short and cladded front overhang, the backward shifted passenger compartment and the very long rear overhang, the X-Class has an elongated vehicle body which exudes pure dynamism. The design of the side windows with their dynamic kink along the beltline and taut lines contrasting with muscular, sculpted surfaces also allude to the longitudinal dynamics. Widely flared wheel arches, the commanding front and the purist design of the rear all accentuate the impression of width. Together they give the pickup a powerful on-road presence and make reference to the X-Class's excellent lateral dynamics. The front has the masterful looks of one of the brand's typical SUVs – with the centrally positioned star, twin-louvre radiator grille, high and powerfully honed bonnet and headlamps extending far into the wings. The front apron emphasises width and has its own distinct character depending on the chosen design and equipment line. On the PURE basic variant it is unpainted and with the PROGRESSIVE design and equipment line it is painted in the vehicle colour. The POWER high-end model variant likewise has a bumper painted in the vehicle colour and also comes with a chromed underbody panelling. There are nine attractive exterior colours and a variety of exclusive 17, 18 or 19-inch rims to choose from across the three design and equipment lines. Optional equipment as well as a specific Style Package for each of the PROGRESSIVE and POWER lines enable further individualisation. 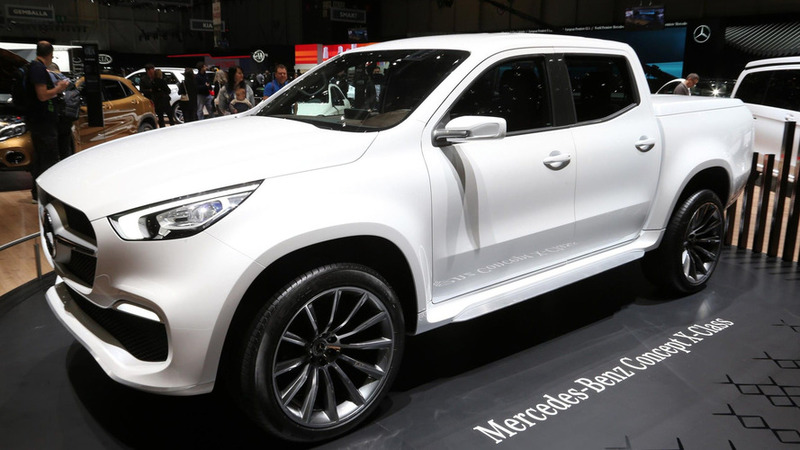 For example, side running boards and an electrically opening rear window can be added to the X-Class. What's more, Mercedes-Benz had an in-house team of designers and developers create an extensive range of accessories. These allow the X-Class to be modified even more to suit personal tastes and requirements – in respect to design, functionality and off-road capability. For example, there is a choice of styling bar, side bar, soft tonneau cover, hard tonneau cover and roll cover, as well as a canopy which makes the pickup look like an SUV. The canopy continues the X-Class's lines perfectly, merging with the vehicle body to create a distinctive silhouette. Other items available include a bed liner, a bed divider system, load-securing rails in the floor and a technical underguard. A high-torque V6 diesel engine will be released mid-2018, ensuring even greater agility on- and off-road. It will generate 190 kW/258 hp and a maximum torque of 550 Nm. With that the X 350 d occupies a leading position in the segment. The top X-Class model will come as standard with permanent 4MATIC all-wheel drive and the seven-speed automatic transmission 7G-TRONIC PLUS with steering-wheel shift paddles and ECO start/stop function. The DYNAMIC SELECT system is available in addition. To date, the inclusion of a drive program switch has been rare in the pickup segment. This technology enables the driving experience to be tailored to individual preferences – from relaxed comfort to engaged sportiness. There are five drive programs to choose from: Comfort, ECO, Sport, Manual and Offroad. These modify the engine characteristics, the automatic transmission's switching points and the ECO start/stop function. The X-Class is the first mid-size pickup to feature a communications module with an integrated SIM card. This makes it possible to use the extensive Mercedes me connect services and to access the vehicle by smartphone. Thus X-Class drivers in 21 European markets can, for example, call up useful information such as fuel level and tyre pressure, and find out the X-Class's location when it is parked or being driven by someone else. In addition, with the Mercedes me app complete door-to-door navigation is possible. Further Mercedes me connect services include the Mercedes-Benz emergency call system and the standard services Breakdown Management, Accident Recovery and Maintenance Management as well as Remote Vehicle Diagnostics. 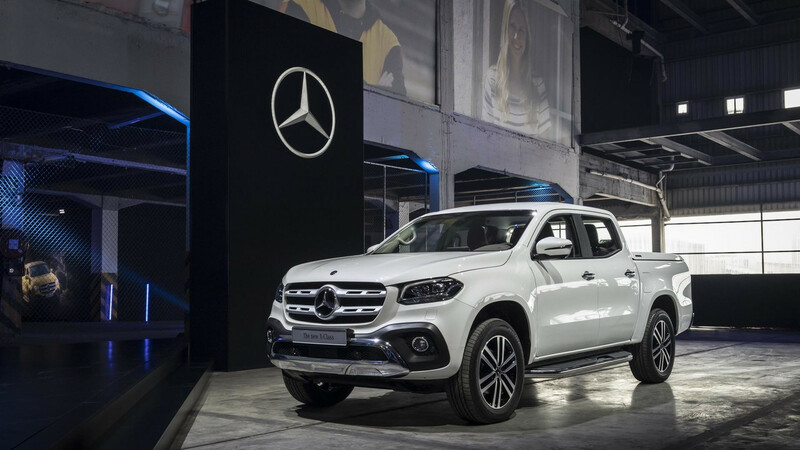 With the X-Class, Mercedes-Benz Vans is expanding its portfolio to a fourth model series and is closing the gap between commercial vehicles and passenger cars. As such, the pickup marks another milestone in the growth strategy "Mercedes-Benz Vans goes global".